Americans won’t be the only ones deal-hunting on the weekend that marks the beginning of the Christmas consumer frenzy, according to eMarketer – Canadians are planning their shopping strategies too. While Canadians learned about Black Friday deals mostly through fliers (48 per cent), search engines also played an important role (44 per cent), and print newspapers rounded out the top three ways Canadians were finding deals for the start of the weekend. When it comes to Cyber Monday later in the weekend, Canadians were most likely to learn about the deals via search engines, followed by fliers (yes physical fliers), then email notifications. Canadians are likely to research deals with smartphones and tablets, but are more likely to complete a purchase from a laptop or desktop when the deal is live. It makes sense that traditional publishing channels such as newspapers and fliers would advertise Black Friday deals to Canadians, as the objective of most literature is to get people into stores, not onto websites. 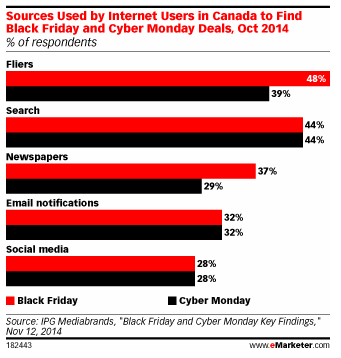 But it’s surprising to see fliers crack the top three ways Canadians are finding out about Cyber Monday events. While marketers seem to be making good use of established online channels like search and email, more could be done online. Channels such as social media or online video could represent an untapped resource for marketers looking to drive awareness of online deals.